Early-earlier 14th century. Formerly 3-storey; 8-bay; large rectangular-plan Gothic block built to accommodate refectory. Incorporates tall 2nd floor windows including large W end window with reticulated tracery; semi-octagonal stairtower at NW corner. Coursed dressed sandstone with ashlar dressings. All windows hood-moulded apart from arrowslits. S ELEVATION: bays divided vertically by slightly stepped buttresses; band courses joining sills at ground and 2nd floor levels and hood-moulds at 1st floor level. Irregular pair of outer bays at each end. Steps up to entrance (to lobby) to outer right; chamfered and rebated jambs and a moulded arch of 3 orders. Wide round-arched window above; moulded arched window to 1st floor. Single ground floor lancet window with chamfered jambs to adjacent bay to left. Paired lancets above. Upper storey jettied out between buttresses, supported over moulded cusped arch. Paired narrow windows above; both with extant mullions and later loop tracery at head. Range adjoins gatehouse to left. Outer left bay has lancet window to ground floor. 1st floor jettied out over segmental arch of 6 orders supporting hanging passage from gatehouse; 2 small lancets to passage and stone flagged roof. Moulded arched window above. Adjacent bay to right contains segmental-arched opening set forward between buttresses under continuation of hanging passage above; smaller entrance set back; small square window to hanging passage. Moulded arched 2nd floor window. Single lancet window to ground and 1st floors to remaining bays; moulded arched window to 2nd floor. W ELEVATION: pair of lancet windows to right to 1st floor. Large moulded arched window with reticulated tracery above. Adjoins gatehouse to right. Semi-octagonal tower to left; divided horizontally by 3 band courses; arrowslits to 3 W sides of 1st stage; one to each of upper stage. Octagonal cap-house surmounted by spire at apex; round-arched opening to SW. E side of tower is partially decayed. E ELEVATION: adjoins dorter at undercroft level. N ELEVATION: only undercroft wall remains, adjoining earth bank. Building is a roofless ruin with no extant glazing. INTERIOR: deeply splayed windows. Remains of rib-vaulting to ground floor (undercroft) walls; originally main hall of undercroft divided into 2 vaulted aisles of 7 bays. Entrance to stair tower at W end. E bay comprises lobby with opposing entrances to main hall and dorter; both with moulded arches to lobby. Entrance into vaulted passage beneath gatehouse at 1st floor level at W end. Former 1st floor doorway (now blocked) giving access to hanging passage to 2nd bay from right on S side. 2nd floor formerly occupied by refectory hall; pulpit set within jettied section of wall to 2nd bay from left; cusped moulded arched entrance at foot of steps; tierceron-vaulted pulpit (probably 15th century) opens into interior via 2-light arcade with moulded arches. Entrance to stair tower at 2nd floor level of W end; weathered Caernarvon arch with late 20th century boarded and studded timber door; turnpike staircase. Entrance to gatehouse set within altered opening to left. Late 20th century boarded and studded timber door with contemporary lintel inscribed 'MUSEUM'. Gatehouse window above to left. Property in care. A-Group with Dunfermline Abbey, Nave, New Abbey Parish Church, Gatehouse, Dorter and Reredorter, Palace and Kitchen and Entrance Gateways and Boundary Wall (see separate list descriptions). 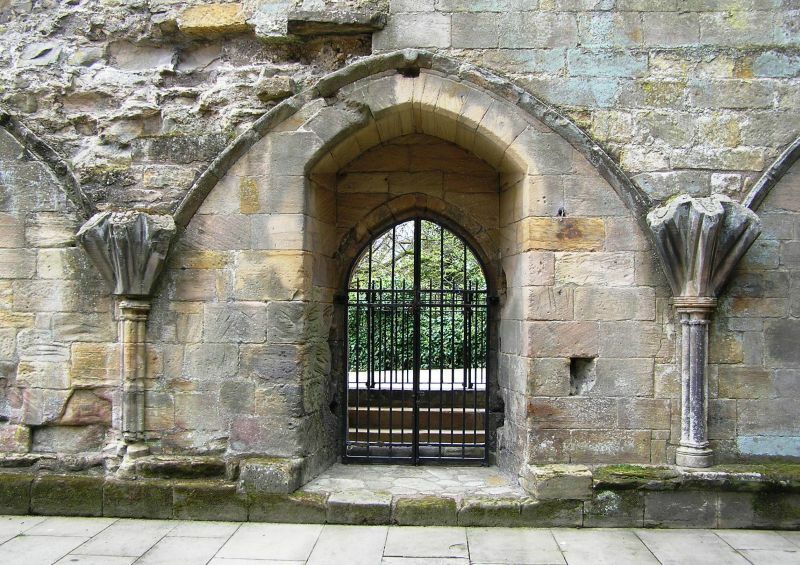 A Benedicting Priory was established in Dunfermline in around 1070 by Queen Margaret, wife of Malcolm III. It was upgraded to an Abbey by her son, David I in 1128. In 1304 the monastery buildings were partly destroyed by Edward I during the Wars of Independence. The buildings were subsequently rebuilt, mention being made of a royal contribution to the erection of the frater block in 1329. The frater range is particularly notable for tis pulpit and finely traceried W window.